When Mildred Jeter and Richard Loving started dating in the early 1950s, the idea that their relationship could change history could not have seemed more remote. When they decided to marry, Richard knew plenty of other people in Central Point, Virginia, had skirted the same legal barriers that stood in their way. Those Central Pointers had always been able to resume their lives afterward with no controversy or consequence. He and Mildred expected the same for themselves. 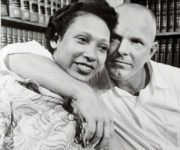 Loving v. Virginia upset one of the last strongholds of segregation. Richard Loving and Mildred Jeter met in 1950, seven miles from Central Point, at a farmhouse where the seven-member Jeter Brothers were staging a bluegrass show. Richard loved listening to bluegrass. That night, however, it was not the performers, but their younger sister, Mildred, who captured his attention. Mildred was a few years his junior and known for being shy and soft-spoken. She thought Richard seemed arrogant at first, but her impression changed as she got to know the kindness he possessed. The two dated for several years, often spending time together at the racetrack, where Richard and two close friends won numerous trophies with a race car they maintained together.